In an epic story that spans 150 years and continues to the present day, Iris Chang tells of a people's search for a better life — the determination of the Chinese to forge an identity and a destiny in a strange land and, often against great obstacles, to find success. 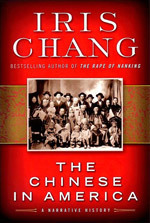 She chronicles the many accomplishments in America of Chinese immigrants and their descendents: building the infrastructure of their adopted country, fighting racist and exclusionary laws, walking the racial tightrope between black and white, contributing to major scientific and technological advances, expanding the literary canon, and influencing the way we think about racial and ethnic groups. Interweaving political, social, economic, and cultural history, as well as the stories of individuals, Chang offers a bracing view not only of what it means to be Chinese American, but also of what it is to be American. In December 1937, in what was then the capital of China, one of the most brutal massacres in the long annals of wartime barbarity occurred. 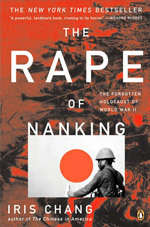 The Japanese army swept into the ancient city of Nanking (Nanjing) and within weeks not only looted and burned the defenceless city but systematically mass executed soldiers, and raped, tortured and murdered tens of thousands of Chinese civilians. The story of this atrocity, one of the worst in world history - 300,000 victims! - continues to be denied by the Japanese government. Using extensive interviews with survivors, newly uncovered documents in four languages and the diaries of John Rabe (a German civilian who led a rescue effort within the city), Iris Chang has written the definitive history of this horrifying episode. Her book tells the story of the Japanese soldiers who carried out the massacre; of the Chinese civilians who endured it; and of a group of Europeans and Americans who refused to abandon Nanking and were able to create a safety zone and save almost 300,000 Chinese lives. 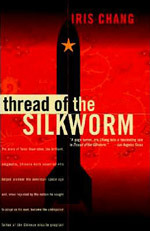 Thread of the Silkworm tells the story of one of the most monumental blunders the United States committed during its era of McCarthyism. It is the biography of Dr.Tsien Hsue-shen (錢學森), a pioneer of the American space age who was mysteriously accused of being a Communist and deported to China, where he became — to America's continuing chagrin — the father of the Chinese missile program.